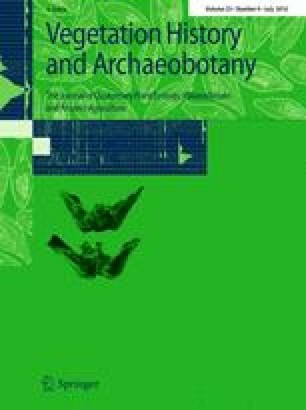 In this study, late Holocene vegetation, climate and human impacts were investigated using multiproxy data-pollen percentages, pollen accumulation rates (PAR), humification and loss-on-ignition (LOI)—measured from peat sediments from Daiyun Mountain, southeast China. A stratigraphic chronology was established on the basis of four radiocarbon dates. The 4,350 year sequence of vegetation history and climate change exhibits three distinctive stages: (1) 4,350–1,000 cal bp, during which the vegetation was dominated by evergreen forests mainly composed of broad-leaf trees, indicating a warm and wet climate; (2) 1,000–550 cal bp, during which the climate was thought to be cool and dry, based on a decrease in pollen percentages and the PARs of trees, shrubs and wetland herbs, and an increase in the pollen percentage and PAR of dry land herbs, as well as high overall LOI values; and (3) 550 cal bp to modern times, during which higher pollen percentages of dry land and wetland herbs, along with low pollen percentage and PAR of trees and shrubs, as well as low absorbance and LOI values, suggest relatively cooler but wetter climate conditions. In addition, major climatic events, such as the warm period from ad 670–960, the Medieval Warm Period (ad 1050–1520) and the Little Ice Age (ad 1580–1850), could be identified within the peat sediments in this study, with climatic conditions at these times being characteristically warm and wet, warm and dry, and cold and wet, respectively. Pollen signals indicate significant human impact since 1,000 cal bp, which may be linked to the development of the local porcelain industry and a rapid increase in the population in the study region. We are grateful to the staff of the Daiyun Mountain National Nature Reserve for access permission and Wei Shi, Feixue Feng and Dang Li for assistance during the field work. We thank the editor and two anonymous reviewers for their helpful comments and suggestions that improved the manuscript. This research was jointly funded by the National Natural Science Foundation of China (NSFC, No. 41371202), the Strategic Priority Research Program of the Chinese Academy of Sciences (XDA05120704), 973 Program under Grant (No.2015CB953800) and the open-ended fund (SKLLQG1313) from the State Key Laboratory of Loess and Quaternary Geology, Institute of Earth Environment of the China Academy of Sciences.